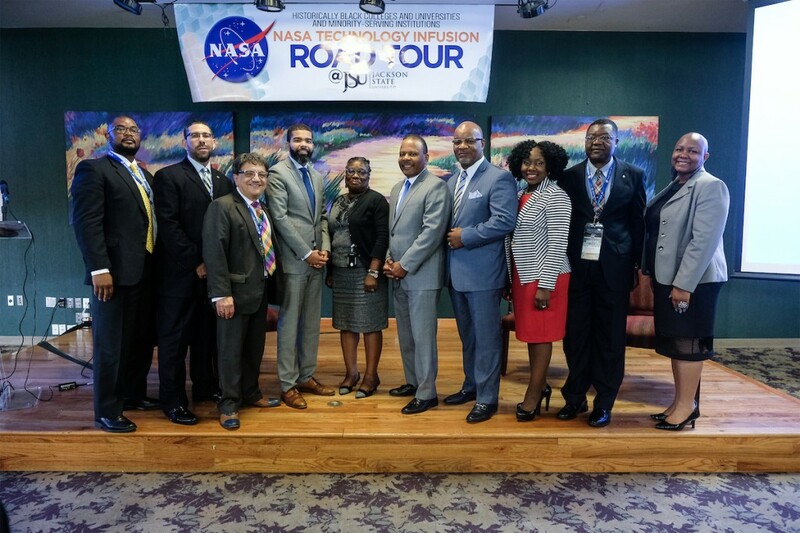 A JSU alum’s keynote address during a two-day NASA Technology Infusion Road Tour hosted by Jackson State University on Tuesday urged visiting HBCUs and Minority-Serving Institutions (MSIs) to position themselves to earn federal contracts and a share of untapped millions. Malcolm Jackson of Washington, D.C., is vice president of Strategic Accounts Phase One Consulting Group, a wholly owned subsidy of Accenture Federal Services. The firm focuses on building strategic relationships with executives in the federal government. Inside the Mississippi e-Center@JSU, he challenged HBCUs and MSIs to learn how to navigate federal contracts while delivering their best products and services. Professionally, he guides clients toward a vision that would offer new technology to federal agencies. His expertise became more evident after President Barack Obama appointed him to a major post. Jackson served as assistant administrator for the Office of Environmental Information and Chief Information Officer for the Environmental Protection Agency. JSU President William B. Bynum Jr. also wants a greater focus on collaboration with the federal government, including NASA. “Our ability to get additional contracts from NASA would increase student internships, student job opportunities and assist JSU in becoming a great feeder institution. Working with NASA also will allow Jackson State to harness the intellectual capacities in our faculty and staff. So, being able to break into the contracting realm would be a whole different ballgame and level of competition. If we’re able to do that, our students will benefit,” the president said. 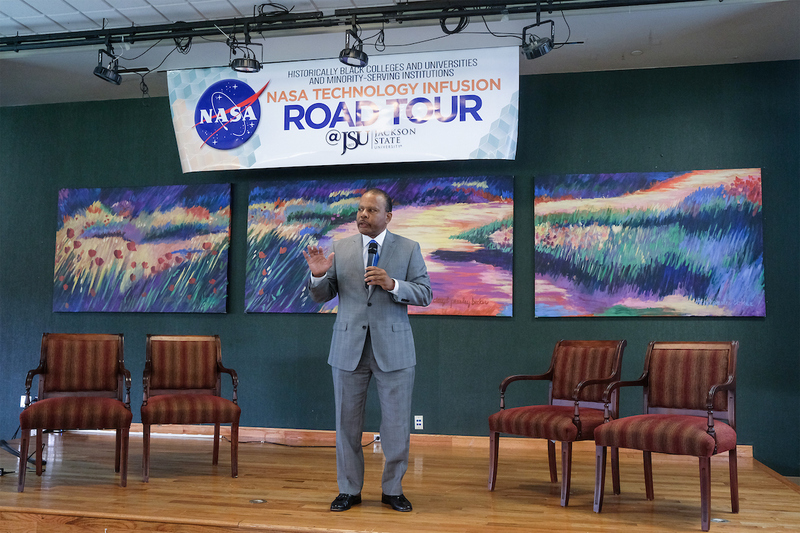 Dr. Richard A. Aló, dean of JSU’s College of Science, Engineering and Technology (CSET), said NASA’s Road Tour is beneficial to everyone. He vowed that JSU will continue positioning itself with the federal government by using faculty research to ensure technological efficiencies. “JSU will develop key alliances with corporate and external entities, and we will assist the U.S. with cybersecurity and implement Big Data solutions. Expect JSU to become a teaching model for understanding contract procurement,” Aló said. Speaking further to the crowd, Jackson said college towns such as Mississippi’s capital city should take advantage of its educational assets because not doing so would be a major loss. Jackson wants to change this, making sure HBCUs and MSIs understand the process for conducting business with the federal government. He said NASA’s Road Tour teaches participants how to garner contracts and use their expertise. 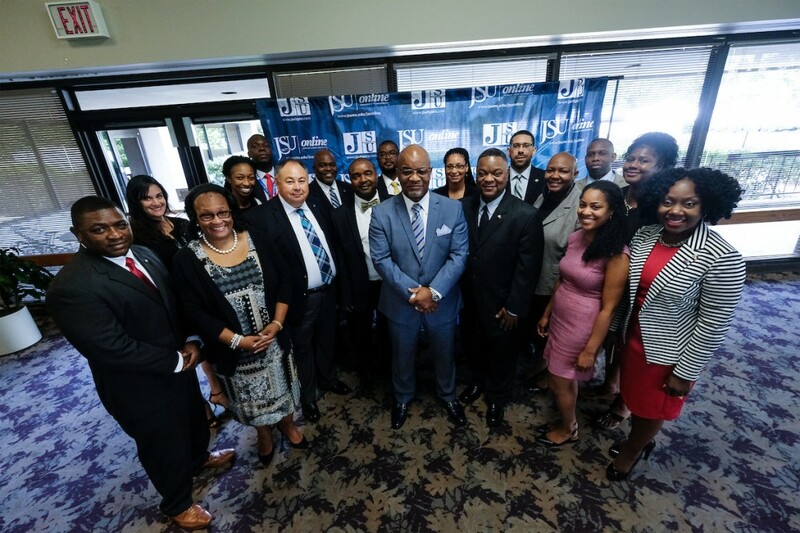 A number of HBCUs and MSIs attended the two-day event that was hosted by JSU’s College of Business; CSET; Information Technology; and Research and Sponsored Programs. Tour workshops addressed the following: ensuring consent and compliance when buying for the U.S. government; university capability briefs; finding opportunities with NASA Mission Directorates; how to apply for grants; networking with large prime contractors; and matchmaking with government agencies. Presentations are available by texting NASARTJSU to 72727. 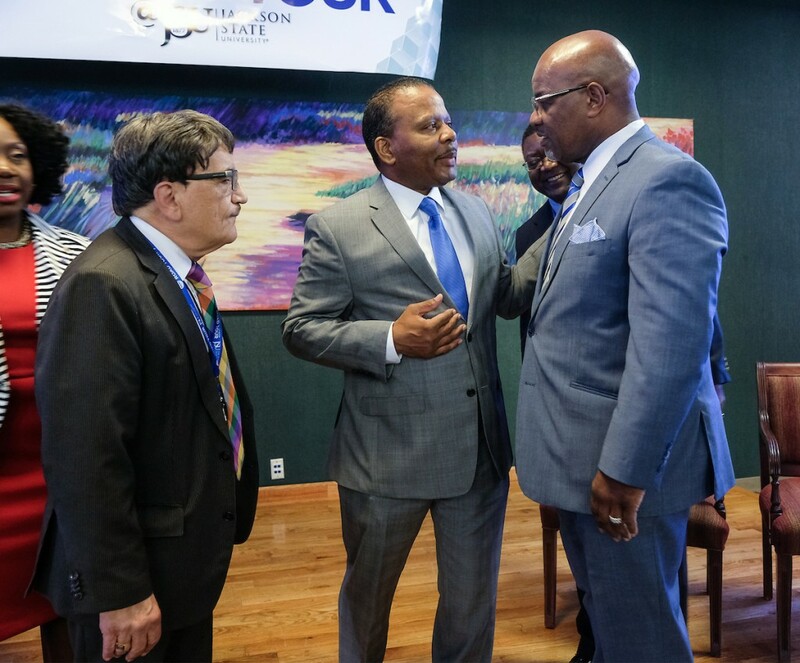 Jackson noted that NASA has an annual budget of $19 billion but encounters difficulty in fulfilling a “collaboration goal” of just 1 percent ($193 million) with minority institutions. On average, the federal government spends anywhere from $85 billion to $90 billion annually on technology. At 1 percent ($900 million) that would be significant for HBCUs and MSIs. Jackson said the Obama Administration recognized there was a problem, so it set aside $3 billion to begin replacing outdated systems. As a result, colleges and universities are being sought to resolve this dilemma.